Being a large city, having your driving lessons in Derby will certainly prepare you for all parts of driving once you are a full licence holder. 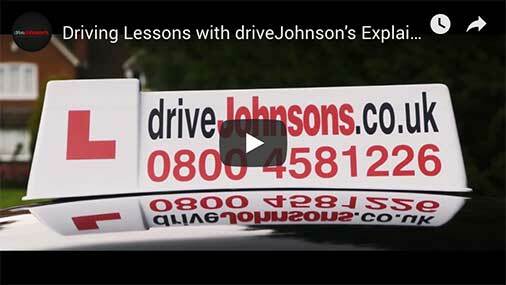 Here at driveJohnson's, we want to teach you how to drive well, ensuring that you're a safe and confident driver, ultimately passing your driving test as quickly as possible. With prices for driving lessons starting at £20, what are you waiting for? Give us a call! As it's a large and busy place, when you start your driving lessons in Derby, it definitely will not be in the heart of the city - this would put you under too much stress as a beginner and would probably put you off. Instead, we'll start you off in a quiet location where traffic is minimal, the roads are straight, wide and have plenty of opportunities to make left and right turns. A quiet location like Oakwood, Allestree, Sunny Hill or Alvaston, depending on where you're being picked up from. Once you've grown in confidence and have mastered the basics, then you can venture further into the city and use some of the faster roads on the outskirts. The DVSA Driving Test Centre in Derby is located right next to a junction on the 70mph A6 and a few complicated roundabouts which can be confusing if you don't know where you're going. Don't fear though - our fully qualified driving instructor in Derby will teach you these routes, ensuring you're prepared for everything the driving test can throw at you. How much do driving lessons cost in Derby?